The margarine and dairy industries have been at war since the late 1800s when the lower-cost butter substitute was first invented. Early on, butter manufacturers believed that if margarine ever became popular it might cut into their sales significantly. And they were right. In order to fight the new product, the dairy industry set out to restricts availability and undercut its appeal in both the courtroom and Capitol Hill. Dairy industry lobbyists worked both in individual states and also on a federal basis to fight the emerging margarine industry. Congress passed the Margarine Act of 1886, which put a two cent tax on the product, as well as restricted its sale and manufacture. Above: An advertisement for do-it-yourself margarine coloring, 1948. In the following years, the pro-butter side managed to pass laws in 32 states either prohibiting margarine manufacturers from coloring their product yellow like butter, or actually requiring them to color it pink, which they hoped would make it less appealing to consumers. 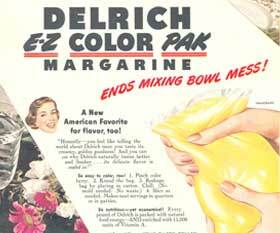 Margarine manufacturers began to sell do-it-yourself yellow coloring kits for consumers to buy and use at home to make their butter substitute more palatable as a reaction. Meanwhile, additional federal laws were also passed, the last of which was repealed in 1996. That date in the caption for the picture of 1848 is off by 100 years. You’re so right, thank you for catching that. Fixed.